Can you help Sandy local historians find the Girtford milestone? Sandy Historical Research Group (SHRG) have a talk on milestones and turnpike roads by Michael Knight of the Milestone Society on 8 October and would like to locate the missing milestone before then. SHRG Secretary Richard Barlow explains “there were two milestones on the Great North Road in Sandy, one at Beeston and one at Girtford. 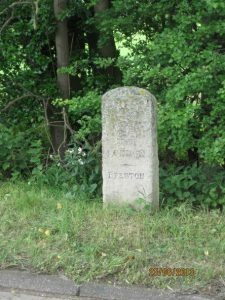 The Beeston stone marked 48 miles to London and is still in place between the old Beeston Cross public house and Girtford Bridge over the River Ivel. A quarter of a mile further north, where the old B658 turns off, there is a replica milestone at the memorial to Frederick Bidlake, the famous cycling timekeeper. The missing milestone marked 49 miles, and stood somewhere between the Akbar restaurant and where Carter Street in Sandy meets the current A1.” If anyone can locate – or maybe even produce – the missing milestone, it really would help. Any information should be sent please to Richard Barlow on 01767 226392.